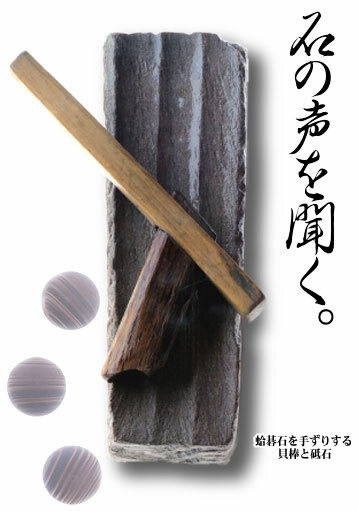 Shudan refers to the intimate communion between the craftsman's hands and his materials. This short (2 minute) film was edited out of a much longer film Brad Schaffer and I are working on at present. I put this one together as an entry in the The Power of Making exhibition that's being held at the Victoria and Albert Museum, in London, over the following few months. In it I demonstrate Yuwake, a traditional hot water casting procedure. The subsequent forging, yama-oroshi or "pounding down the mountain", of the water cast button transforms it into a tsuba. A guard for a Japanese sword. I first came across the term, Shudan, on the website of a manufacturer of fine Igo equipment. In old days, clamshell was shaped one by one using this handmade traditional tool and craftsman finished it as truly artistic Go stone. Go was called "Shudan", which literally means 'hand conversation'. Craftsman and stone interact with each other from the beginning of manufacturing process. Project Professional 2010 includes all the capabilities of Project Standard 2010 plus more features like at-a-glance resource management and team collaboration tools (indicated with the Pro symbol ).